Is this man: a) Sleeping on the job; b) dead in his own-made open-air coffin; or c) dreaming of his next blog post? Well, in July about a couple of hundred highly motivated chaps mount their bikes (and sometimes fall off them) and race them for three weeks around Europe, and this year they came almost past my front door, well, within two miles of it. It’s not every day the Tour de France comes up Skipton High Street on a warm Saturday afternoon. At a real bargain price of £9! It is a very good review of furniture as found in the less fashionable places such as houses of correction, cellar dwellings and bothies – gripping stuff. The ale houses are my favourite. Course my son and I have been avid followers of the T de F for many years, well since 1990. So Will and his wife Eva came over for to see the tour (and a holiday in the UK too!) staying with us, which was great, but took a little time up. We did however, venture into home territory – Lancashire. Partly to visit ancestors’ graves, but also for a very interesting visit to Queen Street Mill in Burnley, now run as an award-winning museum. Yes a cotton mill! My grandmother and my aunt worked at a weaving mill in the next village and I visited with my mother as a child and I was terrified by the deafening noise and the terrifying machinery. The noise was bad enough at Queen Street Mill with just four looms running, never mind the 300 in the weaving shed. Almost as scary as the Thames Clyde express at the level crossing – but that’s a worse story. How Mr McKee does all the hewing he does, just beggars my belief (Oh, c’mon, the guy’s suffered enough, he’s obviously brain-damaged – Ed.). Once sturdy beech joint opening up for the second time. 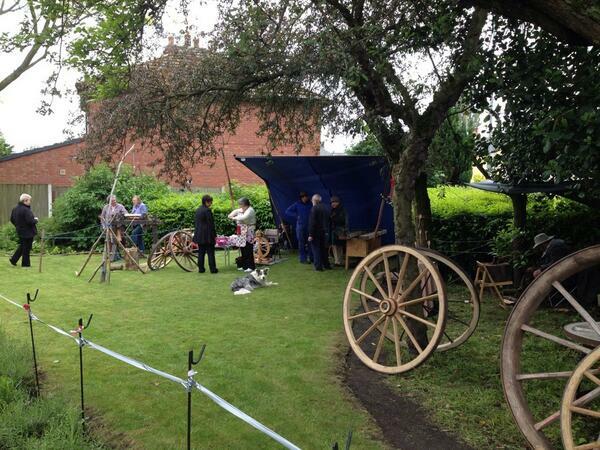 We’ve been to Eccleston near St. Helens, to see some draft and history and meet some friendly people. 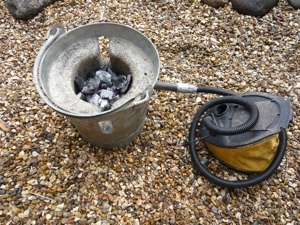 Mark Constable was there, forging fire steels in his minimalist bucket forge running on charcoal and an airbed bellows. We had a good chat about making the forge lining, refractory cement, flue vermiculite, beeswax finishes and the general wonder of making a hard lump of metal into the shape you wish. Mark’s charcoal forge. His own photo from his website. I don’t think I mentioned that I started a short coursette in blacksmithery at Craven College last week, blimey, rather louder than Strid Wood what with 5 fires with their electric blower and extractor fans, 9 people bashing metal and shouted chit chat. I’m making a snail – slowly. Pepper had brought his boss Phil Gregson worshipful wheelwright along with him, I hear Phil is crossing the pond for a grand tour of US museums and that his progress will be tracked and reported on a specially souped up soon to be upgraded website. He’ll be at Colonial Williamsburg first off (in period costume!). Phil had brought his band of Lancastrian bodgers along and we had a bit of a natter about this and that things woody. I failed to take any photos as I was lugging my stock knife around with which I was going to demo peg-making, but the rain was against us. The Wobbly Wheelwright beer was a great success though. Here’s the set up, pole lathery, spinning, spoon carving and the odd wheel. Phil and grandfayther under the shelter and Pepper posing for the camera, centre. The entrance doorway gives a taste of what’s inside. An Elizabethan Manor House, built around an earlier tower, with Victorian remodeling in the 1850s by Sir Charles Barry, designer of the Houses of Parliament. There is no photography allowed inside so the pictures are from the excellent National Trust’s collections database. The plaster work on the ceilings is stunning, the drawing-room especially. Thanks go to Michael P. Conroy for his extensive research on the Shuttleworth family. Much of the information on this webpage is taken from his 1996 booklet1, “The Shuttleworths of Gawthorpe.” Thanks to Deborah Nouzovsky for bringing out the fact that Winston Churchill is descended from Hugh and Anne Shuttleworth. 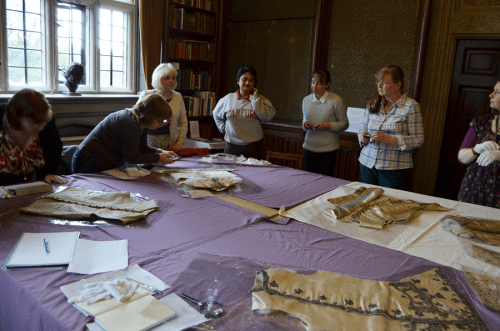 As if all the woodwork and architecture were not enough, the Hall houses the Gawthorpe Textile Collection. 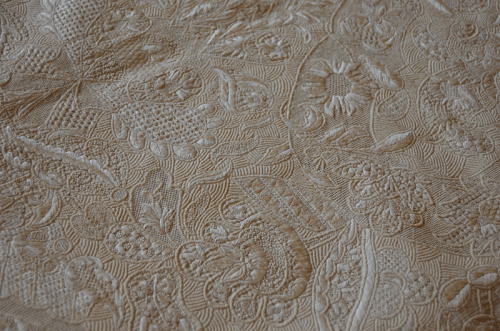 This is an amazing collection of mostly hand worked textiles from many eras and countries collected and many produced by Miss Rachel Kay-Shuttleworth (1886 – 1967). Not only historical artefacts are there but also the crafts are kept alive (as Rachel wished) with resident craft workers and workshops. Feast for your eyes! my tam – at Gawthorpe!